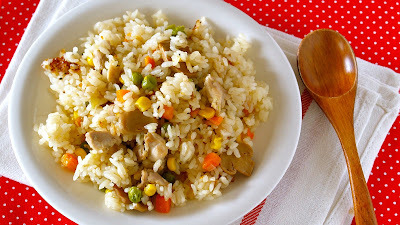 This one dish contains carbohydrate, protein, and vegetables. Perfect well-balanced diet for pregnant and postpartum women. Using mixed vegetables makes the dish even easy and colorful!!! 1. If you are using pre-washed rice (Musenmai) you don't have to wash it. If you washed rice, allow the rice to drain in a strainer for 30 minutes. 2. Heat 1/2 tbsp. of butter in a fringe pan. Cook pre-washed rice until coated with butter. If you are using washed rice, cook for about 5 minutes to dry out water from the rice. 3. Place the rice in a pot, add water to the appropriate level indicated in the pot, then add Sake, salt, and consomme powder, and mix well. 4. Heat another 1/2 tbsp. of butter in a frying pan and cook chopped onion until tender. Add chicken and cook until no longer pink. Add mushrooms and mixed vegetables, then season with cracked black pepper. 5. Place 4. on top of the rice. *do not mix or the rice won't cook evenly. 6. Place the pot into the rice cooker. Cover and press the button to start. 7. When it's done, toss the rice lightly using a rice paddle. Then serve in a dish.